This list covers coalition forces in Afghanistan in 2012. See the article Participants in Operation Enduring Freedom for coalition support for Operation Enduring Freedom from October 2001 to 2003. For coalition forces involved in NATO combat operations in the past, see the articles Coalition combat operations in Afghanistan in 2006, Coalition combat operations in Afghanistan in 2007, and Coalition combat operations in Afghanistan in 2008. See also article International Security Assistance Force. 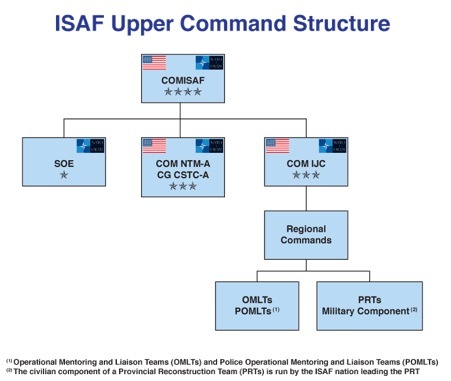 Below is the disposition and structure of international military forces that were participating in the War in Afghanistan in November 2012, listing deployed units under the command of the International Security Assistance Force (ISAF), which controlled both combat and reconstruction operations (often led by the Provincial Reconstruction Teams). During its existence from 2001 to 2014, ISAF comprised units from many countries. In this article, units are assumed to be from the United States unless otherwise stated. This list is a rough and unofficial listing of units and formations. An ISAF soldier from the U.S. 25th Infantry Division patrolling the Paktya Province in January 2012. An ISAF soldier from the U.S. 4th Infantry Division during a joint operation with Afghan police in Kandahar in February 2012. An ISAF Marine walking alongside Afghan children in Afghanistan's Helmand Province in April 2012. ISAF soldiers with Afghan policemen in April 2012. ISAF soldiers in Farah Province in April 2012. An ISAF soldier in May 2012. An ISAF sailor in June 2012. ISAF soldiers in July 2012. An ISAF soldier in August 2012 engaged in battle. ISAF soldiers in August 2012. An Afghan soldier in November 2012. An Afghan policeman in December 2012. The overall command of the NATO-led International Security Assistance Force in 2012 started from Supreme Headquarters Allied Powers Europe at Casteau, Belgium. The overall command was vested in Joint Force Command Brunssum at Brunssum in the Netherlands, then the Commander ISAF (COMISAF). The COMISAF in 2012 was USMC general Joseph F. Dunford, Jr., at ISAF Headquarters in Kabul. There were three subordinate commands under COMISAF: the Intermediate Joint Command, which controls the tactical battle along the lines of the Multi-National Corps Iraq; the NATO Training Mission-Afghanistan/Combined Security Transition Command – Afghanistan, which trains the Afghan National Army; and Special Operations Forces. The Intermediate Joint Command in turn controlled the regional commands, roughly analogous to divisions. There were six regional commands: Capital (at Kabul), South, Southwest, North, East, and West. Each regional command had a headquarters to provide command and control and logistics support for its area of responsibility, and comprised both combat units and Provincial Reconstruction Teams (PRTs). 1st Battalion Motorized Task Force (Turkey) Camp Dogan, Kabul Responsible for Kabul Province. 2nd Battalion Motorized Task Force (Turkey) Camp Gazi, Kabul Responsible for Kabul Province. Regional Command Capital has no Provincial Reconstruction Teams. Area of responsibility: Kandahar, Orūzgān, and Zabul Provinces. Combined Team Uruzgan Camp Holland, Tarin Kowt Responsible for Orūzgān Province. (Task Force Lancer) Camp Nathan Smith Responsible for Kandahar City and Arghandab District. (Task Force Wings) Kandahar Airfield Aviation support for Regional Command South. PRT Kandahar Kandahar Lead country: U.S.
PRT Zabul Qalat Lead country: U.S.
(Task Force Helmand) MOB Lashkar Gah Conducts ground operations in central Helmand Province. (Task Force Leatherneck) Camp Leatherneck Responsible for Nimruz Province and northern and southern Helmand Province. 3rd Marine Aircraft Wing Camp Leatherneck Aviation support in Helmand and Nimruz Provinces. Joint Aviation Group (United Kingdom) Camp Bastion Headquarters for British aviation units. (Task Force Dragon) FOB Sharana Responsible for Paktika Province. (Task Force Warrior) Jalalabad Airfield Responsible for Nangarhar, Laghman, Nuristan, and Kunar Provinces. (Task Force Bayonet) FOB Shank, Logar Responsible for Logar and Wardak Provinces. (Task Force Destiny) Bagram Airfield Provides aviation support for eastern and northern Afghanistan. (Task Force Spartan) FOB Salerno, Khost Responsible for Khost and Paktia Provinces. (Task Force Lafayette) FOB Nijrab, Kapisa Responsible for Kapisa Province. 6th Airborne Brigade (Task Force White Eagle, Poland) FOB Ghazni Responsible for Ghazni Province. PRT Kapisa Lead nation: U.S.
PRT Panjshir Lead nation: U.S.
PRT Paktika Lead nation: U.S.
PRT Mehtar Lam Lead nation: U.S.
PRT Khost FOB Salerno Lead nation: U.S.
PRT Nangahar Jalalabad Lead nation: U.S.
PRT Patkia Gardez Lead nation: U.S.
PRT Kunar Asadabad Lead nation: U.S.
PRT Nuristan Lead nation: U.S.
Area of responsibility – Badakhshan, Baghlan, Balkh, Faryab, Jowzjan, Kunduz, Samangan, Sar-e Pul and Takhar Provinces. Task Force Kunduz (Germany) FOB Kunduz Operating in eastern Regional Command North. Task Force Mazar-e-Sharif (Germany) Camp Marmal Operating in western Regional Command North. Expeditionary Air Wing Mazar-e-Sharif (Germany) Camp Marmal Aviation support for northern Afghanistan. Task Force Badghis (Spain) Qala-e-Naw Operating in Badghis Province. (Task Force Center) Camp La Marmora, Shindand Operating in southern Herat Province. (Task Force Genio) Herat Engineer support for western Afghanistan. (Task Force South) Camp El Alamein, Farah Operating in western Farah Province. (Task Force Southeast) Camp Lavaredo, Bakwa District Operating in eastern Farah Province. (Task Force Fenice) Herat Airfield Providing aviation support for western Afghanistan. PRT Farah Lead nation: U.S. In 2012, the overall command of the U.S.-led coalition effort in Afghanistan—known as Operation Enduring Freedom—Afghanistan—was headquartered at Bagram Air Base, Afghanistan, which reported to United States Central Command. OEF-Afghanistan's two major commands in 2012 were Combined Joint Task Force 101, and the Combined Security Transition Command – Afghanistan (CSTC-A). After the Stage IV transition of authority to ISAF, the status of the 10th Combat Aviation Brigade/Task Force Falcon, which handles all the helicopter combat aviation duties in Afghanistan, was uncertain, along with the exact status of Combined Task Force Sword, the engineer task force, and the Combined Joint Special Operations Task Force. It was unclear exactly what units are assigned to OEF-Afghanistan, but the operation in 2012 was in charge of counter-terrorist operations, including pursuing al-Qaeda along Afghanistan’s inhospitable border region with Pakistan. In 2012, this command was responsible for training the Afghan National Army and the Afghan National Police through its headquarters and Combined Joint Task Force (CJTF) Phoenix. CSTC-A was responsible for mentoring the ministries of defense and interior, while CJTF Phoenix was responsible for mentoring Afghan National Army corps and below and Afghan National Police districts and below. CJTF Phoenix was headquartered by the 33rd Brigade Combat Team, Illinois Army National Guard, which relieved the 27th Brigade Combat Team, New York Army National Guard in late 2008, which relieved the 218th Brigade Combat Team, South Carolina Army National Guard in early 2008. The rest of the task force was made up of National Guard and Reserve personnel from 42 states, U.S. Marine Corps reservists, active duty representatives from the U.S. Air Force, U.S. Navy, and U.S. Marine Corps, and soldiers assigned from France, Germany, Romania, Canada, New Zealand, Mongolia, and the United Kingdom. ^ "ISAF – Provincial Reconstruction Team in Logar". Archived from the original on 19 November 2007. Retrieved 18 March 2008. ^ For more on Regional Command West, see "The Italian Job". Jane's Defence Weekly. (5 November 2008) and the Jane's Interview, same issue. ^ "Securing Afghanistan". Archived from the original on 9 April 2008. Retrieved 26 March 2008. Wikimedia Commons has media related to War in Afghanistan in 2012.